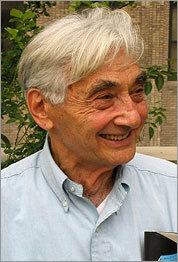 I don’t have many heroes, but Howard Zinn was one. As a historian, he insisted that the voices of the powerless be heard. As an activist, he lived his beliefs. The term “populist” is currently used and abused in the media. Howard Zinn understood what the term should mean. If you haven’t heard of Howard Zinn, I doubt anything I can say will make him live for you and I am sure the obituaries will turn his life into a sound bite. So, my suggestion would be to go here and by a copy of A People’s History of the United States. Even if you have read it at some point in the past, read it again. It will put some of today’s craziness into perspective. ← Mr. Freeze Panders to the Dodos? Going now to pick up the copy of Howard’s story on DVD from the library. Going to eat, fold clothes, and watch one of the greatest historians/writers.